As the curtain falls on the presidency of Barack Obama many efforts are underway seeking the pardons or commutations for political prisoners past and present. The problem according to Abdul-Jabbar Caliph co-chair of the National Jericho Movement is the government is in denial that political prisoners exist in America. “They believe political prisoners do not exist classifying them as nothing but common criminals,” he told The Final Call. “We dispute this assessment especially those affiliated with the Black Panther Party. They were politically motivated as far as their commitment to the Black liberation movement and they are in fact prisoners of war. They are in jail for their participation in efforts to liberate Black people,” said Mr. Caliph. Former Black Panther political prisoner and current activist Marshall Eddie Conway who served nearly 44 years in prison before his release agrees with Mr. Caliph’s assessment. In a recent interview with The Final Call he said, “I wrote a book called ‘The Greatest Threat’ that researches the United Nations political prisoners standards designation, the world’s standards if you will. The political prisoners here in the United States fall under these criteria. They are comparable to other political prisoners in countries such as South Africa, England (and) Ireland,” he said. “America denies the existence of political prisoners because it does want people around the world to think there are flaws in the system and people are resisting those deficiencies,” Mr. Conway asserts. So up against a government that is in complete denial grassroots efforts continue on behalf of political prisoners. On the eve of the Democratic National Convention earlier this year in July, a group of activists from across the country met in Philadelphia and called on President Obama to pardon all political prisoners. The U.S. has the world’s biggest prison system that is not filled with nonviolent drug offenders alone. Before and alongside the war on drugs, mass incarceration was built through the wholesale repression of radical movements— especially in communities of color. Two noteworthy political prisoners who have long sought commutations from Obama and other presidents before him: Leonard Peltier and Oscar López Rivera. Both men are longtime activists who have each served more than 30 years in prison and garnered international support for their release from figures such as Archbishop Desmond Tutu and organizations such as Amnesty International. According to an article published in UK-based newspaper The Guardian, Mr. López Rivera is one of the U.S. and world’s longest-serving political prisoners. Now age 73, he has spent more than half his life behind bars. He was convicted of killing or hurting no one. In 1981 he was convicted on “seditious conspiracy” stemming from an alleged plot against the U.S. in the fight for the independence and sovereignty of his home country of Puerto Rico. Mr. López Rivera is accused of being a leader in the Puerto Rican nationalist group Armed Forces of National Liberation (FALN). The organization was charged in a series of bombings in Chicago and New York in the 1970s and 1980s. Mr. López Rivera as well as supporters are adamant he was not involved in the bombings and there was no evidence connecting him. Lin-Manuel Miranda, creator of the smash Broadway musical, Hamilton, confronted President Obama about López Rivera face to face during a White House visit in October. On Oct. 9 thousands of supporters gathered outside the White House bearing placards of the long-time freedom fighter and calling on Obama to set him free. 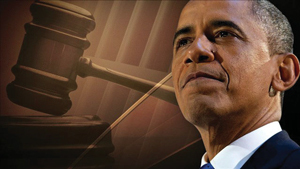 His clemency petition lies on the desk of President Obama. On Dec. 8 a group of supporters from Puerto Rico and the U.S. held a press conference on Capitol Hill several days after the White House received more than 100,000 signatures asking for his release reported nbcnews.com. Leonard Peltier’s very life may depend on a presidential pardon. He is an Anishinabe-Lakota of the American Indian Movement (AIM) serving two life sentences for the 1975 death of two FBI agents killed during a confrontation between the FBI and AIM on the Pine Ridge reservation. “Now Leonard is 71 years old. He, as many of the political prisoners in this country are suffering from a range of health challenges but most recently he was diagnosed with an abdominal aortic aneurysm which if not operated on has a 90 percent of fatality,” said Jasmine Heiss, a senior campaigner for Amnesty International USA’s Individuals at Risk Campaign. “Now if the Federal Bureau of Prisons [allows] to operate on Leonard, he should be fine. He has not been given either his first MRI result or his most recent MRI, so we have no way of knowing how great his health is at this particular moment,” she said. According to Alicia Garza, co-founder of Black Lives Matter, America’s political prisoners remain incarcerated for their vision of universal social justice. “So we have to ask ourselves, why is the state afraid of them,” Ms. Garza said in a recent forum. 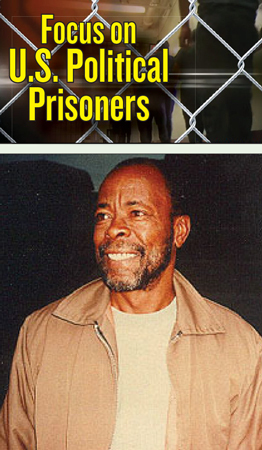 Others still fighting for release, pardon or clemency include Mumia Abu-Jamal, Assata Shakur, Imam Jamil Al-Amin, the MOVE 9, Omar Askia Muhammad and many more. An online petition on Change.org urging President Obama to pardon former Detroit Mayor Kwame Kilpatrick has also garnered over 27,000 signatures. He was convicted on 24 federal criminal counts involving corruption in office in March 2013 after a trial on charges of extortion, bribery, racketeering and fraud. “He gave the city hope again, brought investments in and he truly did make a positive impact in a community that had been headed for destruction since the 50’s because labor costs, white flight and the decline of the Big 3 automotive companies,” noted the petition. Mr. Kilpatrick was wrong but 28 years is too excessive, it added. Student Minister Abel Muhammad, Representative to the Spanish-Speaking People of the Western Hemisphere for the Honorable Minister Louis Farrakhan and the Nation of Islam, has long advocated for the release of Mr. Lopez Rivera. “My prayer is President Obama would right a grave wrong not only for Oscar but Leonard Peltier and Abu-Jamal. He has the opportunity to influence or impact this decision in his last days in office. He is very quiet unfortunately about much of the ills that affect our community,” said Student Minister Abel Muhammad. “I would pray that his compassion as one who has struggled in the community, as one who has seen firsthand the plight of Latino’s and the have-nots and Black people in Chicago, he could see the benefit of having Oscar come back to his community, in a time when his community needs him more than ever before. It is my hope his activism roots in Chicago get the better of him in his last days of the office,” he added. The Guardian article written by Ed Pilkington and published in mid-October concludes that the Hillary Clinton “backlash” perhaps explains President Obama’s apparent ambivalence on the matter. He is reported to have told Lin-Manuel Miranda that López Rivera’s clemency petition was on his desk. But Congressman Luis Gutierrez (D-IL), who is of Puerto Rican descent and has been a leading proponent of a pardon, has said that when he asked Obama about the account, the president firmly disputed it and gave a bland statement that procedures must be followed, the article added. Though President Obama has granted clemency to more people convicted of federal crimes than any chief executive in nearly 50 years according to the Pew Research Center, his years of refusing to attend to certain cases attest to an indifference to the unjust detention of political prisoners by the government he leads, say some activists. Mr. Conway agrees stating many of President Obama’s pardons are for old, obscure and “trivial drug convictions.” As of Nov. 30, Obama has granted clemency to 1,093 individuals (the vast majority convicted of drug-related offenses), a figure that includes 1,023 commutations and 70 pardons, the highest total for any president since Lyndon B. Johnson, states Pew. Regarding the posthumous pardon request for the Honorable Marcus Garvey, according to News America, a petition to urge President Obama to pardon the Jamaican-born 20th century Black nationalist and proponent of Pan-Africanism seems doomed to fail yet again because it did not meet the signature requirements. Even with the necessary signatures, it was improbable because Obama’s Justice Department has signaled its reluctance to consider pardons for people who are already dead. “It would help his legacy because he didn’t do anything that he promised to do. For the most part, he did nothing for grassroots Black folk. That would at least take the bitter taste out of our mouth,” said Mr. Conway. Nation of Islam National Prison Reform Student Minister Abdullah Muhammad has another take on the matter. He told The Final Call, President Obama is not the last chance for many of the country’s political prisoners to be pardoned. “It is, however, Obama’s last chance to leave a legacy that reads that he pardoned strong freedom fighters who are justified in their way of opposing the mind and forces of Satan’s program called Cointelpro,” he said.